The philanthropic spirit of Shentel stretches back to its earliest days. Significant donations of funds, time and materials are given to the communities we serve – evidence of Shentel’s desire to create deeper connections. The company has two favorite programs that are embraced in all service areas – the Summer Backpack program in June and The Big Give in December. The Backpack program was established as a way to ensure that kids who rely on school for meals, would have access to food in the summer. Since Shentel has started this program, the company has contributed more than 6 tons of food to various food banks and community food pantries. The yearend program called The Big Give is a success on many levels. Employees adopt families, senior citizens, nursing homes, orphanages or charitable organizations to make sure those without are able to have a happy holiday season. The company divides into teams and work to raise the money needed for the special project they have selected. The hundreds of people impacted each year are grateful for the gifts, food and clothes, but the Shentel employees often feel that they are the ones who have received the best gift. These philanthropic opportunities – in addition to others like Adopt-a-Highway, park renovations etc. – extend and build staff relationships and pride in the Shentel brand. Executives, customer service representatives, store managers, supervisors, technicians – all categories of Shentel employees – volunteer side by side as teammates to make a positive difference in the communities we serve. The sense of pride that accompanies giving is very alive at Shentel. 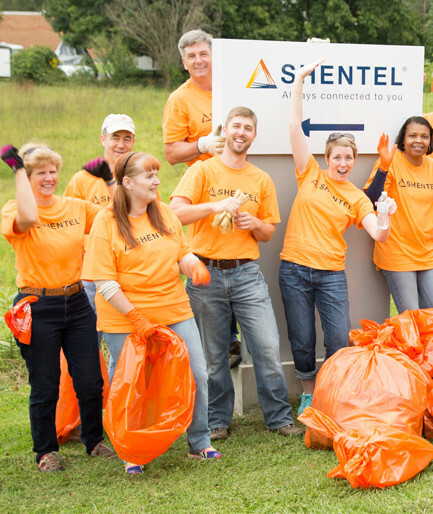 A group from Team Shentel celebrates after picking up litter along US 11 in front of corporate headquarters.